Commit to 2019 with intention, planning and boundaries. Here we are at the end of January already. Changes are good. 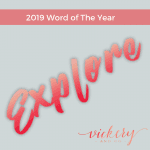 You have reflected on the past year, created some type of vision board and maybe even set a Word of The Year for yourself. I’m willing to bet you also set some goals for yourself. Guess what? Those goals are not likely to happen without some serious intention and planning behind them. When I work with clients 1:1, or even in a group setting, I always ask them to make a firm commitment to the things they agree to do. If you are going to write a blog post, I want to know what day and time you intend to sit down and write. Then, I want you to promptly go and schedule it on your calendar. Why do I push for that level of intensity and commitment? Because without it, most things don’t actually happen! Making and keeping commitments is hard. Without the dedicated intention behind it, things simply get lost in the shuffle! But the truth of the matter is that the personal commitment and intention is where the magic lies. Yes, commitment can be scary. Just the other day, while in a group coaching session, I had a client (who I have known for years) tell me she doesn’t really “like” schedules. She feels tied down when she uses one. I giggled because I have heard this line before. It’s what unorganized people tell themselves to justify why they are unorganized. We are “free spirits,” they say. A schedule will kill my soul. But intentional commitments set you free. I say this without hesitation because I have seen it happen over and over again. 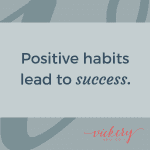 While it doesn’t always feel easy, I can tell you that if you work on it consistently, it eventually becomes a habit. So I encourage you to set intention towards your goals and really go for it. That’s the next question! You may be ready to commit in 2019, but you have no idea what that even looks like. It feels tricky. I’ve been there. As with all other changes, real commitment requires a game plan. So, together, let’s dive in. One quick note – you will notice I don’t use the word “goal.” To me, a goal is something you think maybe you kind of want to do one day. A commitment is something you will do. With commitment comes intention. There is a lot of power in that. Step one: Start with one or two big commitments for the year. This is not a to-do list. This is vision planning. Who do you want to be in the coming year? What do you want to experience as a person and a business? You owe it to yourself to take this seriously. Write your commitment down. Physically log it. In some cases, you may even want to say it out loud. Let the universe know it is your intention and then do the work. Trust me; it makes a difference. Step two: Post your commitment in a central place. Whether you keep a post-it note front and center on your desk or you write across a giant dry erase board in your kitchen, make your commitment visible. I personally hang my commitments above my desk as a constant reminder of what I am working towards. This step will look different for everyone, but it’s not a part you’ll want to skip. Step three: Break your commitment into smaller pieces or goals. This part is really important! If you’re going to succeed and really see your commitment stick, it’s imperative you break it into small, manageable tasks or goals. These smaller items become your daily or weekly commitments. I like to write down my intention for the week. This includes the top three things I want to accomplish. Sometimes this can all seem tedious, but it is crucial for this personal work. Growth stems from clarity, so you need to get very clear on how you will make these things happen. I’ve learned that if I don’t write down what I am focusing on, I tend to lose track and find myself wasting a lot of valuable time. There are so many distractions in our everyday lives, so keeping your boundaries at the forefront is key. Creativity is discovered most within boundaries! Once I have identified each of the smaller commitments required to achieve a larger commitment or vision, I take an extra step and put these items in my schedule. In so doing, I create intentional time and space to complete each task. I am promising myself this will be undisturbed and dedicated time. In turn, I get my work done faster and more effectively, and I really like being fast and effective! 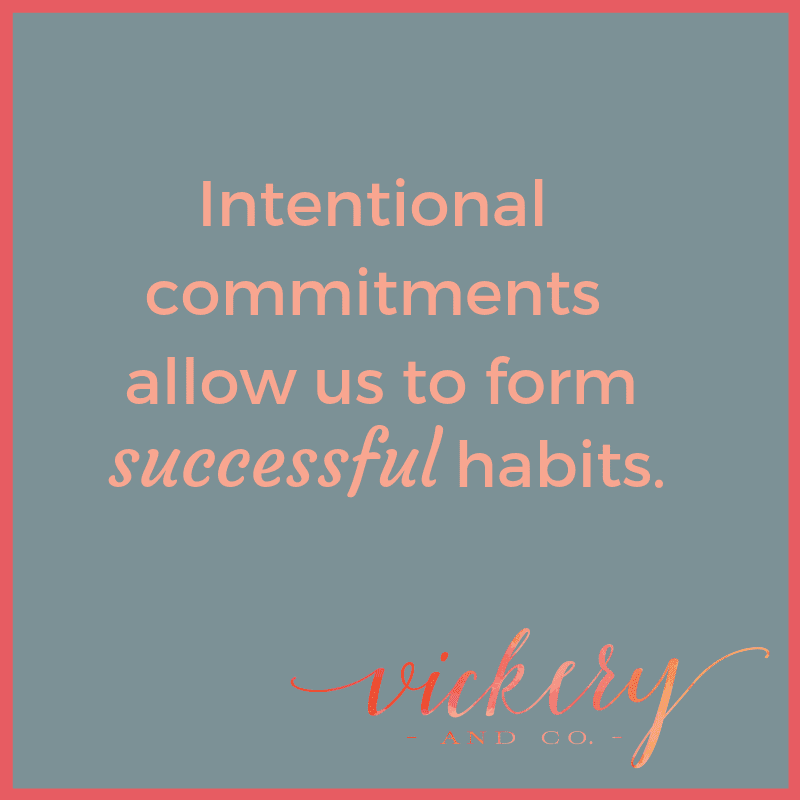 When you are intentional about all elements of commitment, you will develop success-related habits. I’m telling you, it’s an amazing feeling! Need a little support or come clarity around how to best set and achieve commitments? I am here to help, so, please reach out. I’d love to have a Virtual Coffee Date with you, so we can walk through your intentions together!